This is Ilan-TrioKS v1.45 - /English Version/ - The new SUPER Expert Advisor. please can you post a working set file for this EA....because all effort to run it always crash account, both on live and demo accounts. This Expert Advisor Ilan-TrioKS-v1.45 working perfekt !!! thanx for the ea I´ve tried it on demo account on eurusd 15min and set it to trade 0.01lots however sometimes it took a trade with 0.02 lots even 0.04 lots. at the end of day I stopped some trades manually couse it was Friday. It made a profit almost 40 dollars. 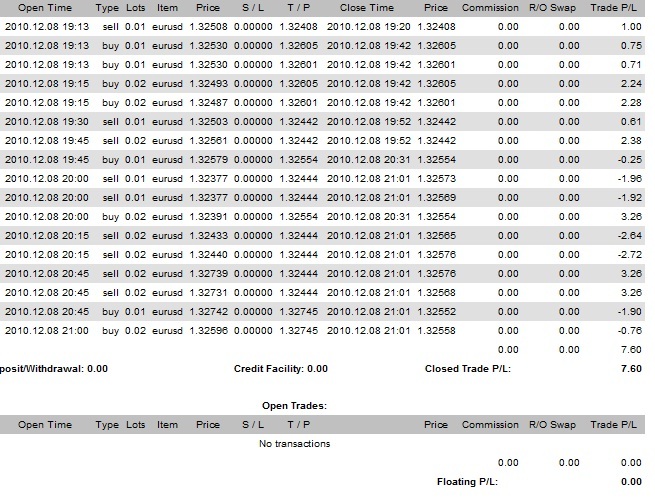 tried it on live account for 2 hours on eurusd and set it to trade 0.01lots then I stoppend the trades manually with profit 7,60.
it´s risky I know.. I found out that it´s working better during range. I am still testing it on demo and I think maybe it´s better to use it after closing ny session and before opening london s. to avoid big movements but I am curious about the opinion of others. Does the open up 3 trades at once (sell, buy, buy)? Did it perform that way for you? Could you please share your set file?